Rivers Turn Blood Red In Africa & Indonesia - A Sign from Heaven? Many viral videos are flooding social networks around the world documenting the most interesting phenomenon that no one really can explain: Various rivers in Africa and Southeast Asia have turned to bright red, resembling the Biblical plague of 'Blood' in Egypt. In the videos, dozens of Indonesians and Malawi residents are seen gathering on the banks of the river watching in disbelief. The phenomenon began in the past few weeks. A village resident in Malawi was stunned to discover the strange color of the river when she went to the Dedza River near her home to wash. (The Dedza river is the source of Linthipe River). 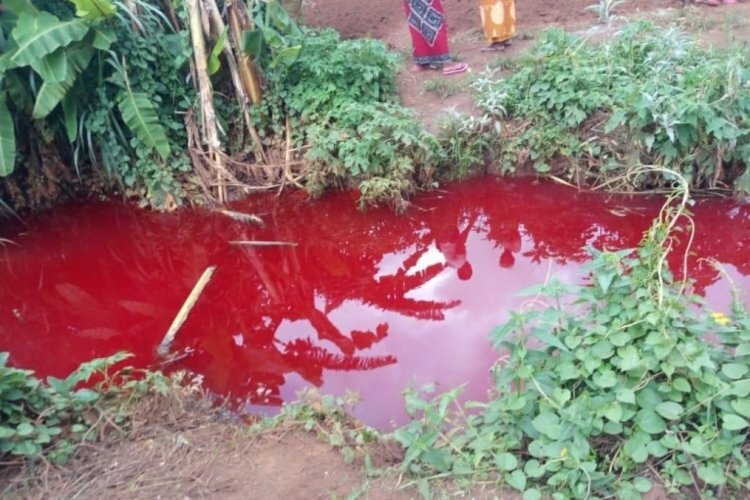 "We came to the river to wash clothes and take water from the house, but suddenly we saw that the water was red, as if everything was flooded with blood, the river was all red," the woman said in an interview with local media. Soon this became known in the nearby villages, as people flocked to witness the extraordinary spectacle - which continued to leave the locals deeply concerned. Another small river in the city of Jayapura, Indonesia, has also recently turned entirely red. Media outlets are trying to explain the phenomenon, and the responses are divided. Some say that it is oxidized, while others claim that it is nothing more than a Heavenly intervention like the plague of blood in Egypt. Is this a sign of the End of Days?